Garfield and Friends is an animated cartoon series based on Garfield, a popular comic strip by artist Jim Davis. Each episode features three segments, two of which focus on the opinionated feline and one about a quirky farm in the Midwest. 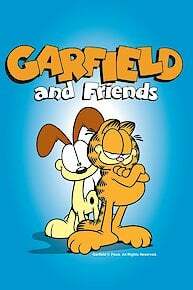 The show features the antics of a sometimes grumpy orange tabby cat named Garfield (voice: Lorenzo Music) who loves lasagna, sleeping, complaining, sarcasm, disrespecting his owner, and tormenting the family dog, a beagle named Odie (voice: Gregg Berger). Garfield spends nearly every episode trying to get his way, which usually ends up not working out in the manner he expected. His owner Jon Arbuckle (voice: Thom Huge) is a socially awkward cartoon artist who has a struggling relationship with veterinarian Dr. Liz Wilson (voice: Julie Payne). Most of his dates with Dr. Wilson end up ruined due to something Garfield does either on purpose or inadvertently. US Acres is a crossover from the Garfield series. The story centers on the life of a farm pig named Orson (voice: Gregg Berger). Orson loves to read and daydream while micromanaging his friends Roy the rooster, (voice: Thom Huge) a bully who constantly picks on the other animals for his own amusement, and the alarmist Wade the Duck (voice: Howie Morris), a phobic hypochondriac who wears an inner tube around his waist for safety, even when on land. The likely obsessive-compulsive Orson spends most of his time helping the other animals get along with one another while trying to keep clean. Two other characters of note are a pair of chicks who also live on the farm named Booker and Sheldon (both voiced by Frank Welker). Booker is a happy, self-assured chick while his brother Sheldon stays in the comfort of his own shell with only his feet sticking out of the bottom so he can walk around the farm. There are 121 total episodes of Garfield and Friends. Though most are nonlinear, some plot segments continue through more than one installment. There are seven seasons, but every episodes focuses on one main theme: friendship. He has been called by one critic "both thorny and funny, a rogue who somehow never crosses the line into villainy." The rotund and acerbic Garfield the cat lives up to that billing in the tuneful cartoon. As the story opens, Garfield and his pintsized - and dimwitted playmate, Odie the mutt, are about to play havoc with a nasty neighbor. Unfortunately, their friskiness lands Odie in the city pound. And that leaves it up to a rueful Garfield - turned even fatter and sassier by midnight snacking on his favorite food (lasagna) - to break into the dog pound and break Odie out. On Thanksgiving, according to Garfield, people "celebrate food by eating as much of it as possible. It's a tradition, I love tradition." But that tradition is history following a checkup from veterinarian Liz Wilson, a sassy lady who's also the new heartthrob of Garfield's owner, Jon. The bad news for Garfield: he must go on a diet. The good news for Jon: Liz agrees to come to his house for Thanksgiving. Come the holiday, Jon is in high spirits, busily readying for his dinner guest. Garfield, however, is in the doldrums. He's facing a half of a leaf of lettuce for breakfast, contending with the goofy pooch Odie as his diet monitor and feuding with a talking scale that reads his weight and calls him Orson Welles. Co written by "Garfield" creator Jim Davis. Lou Rawls and Desiree Goyette sing the musical numbers. "Garfield's Halloween Adventure" finds the feisty feline and his pal Odie dressed as pirates out to pillage a village and return with bagsful of candy. Instead, the two get shipwrecked, then discover a haunted house inhabited by treasure hunting pirates who've returned from the grave. Lou Rawls sings "This Is The Night" and "Scaredy Cat." "The world is filled with excitement," Garfield tells Odie. "If you just use your imagination, you don't even have to go find it. It'll find you." And so it does, beginning with Garfield's dream that he's a submarine commander in combat, and continuing with reveries about a Wild West showdown and airborne heroics. But Garfield's most elaborate fantasy is a spoof that melds "The Maltese Falcon" with an adventure worthy of Indiana Jones. In this daydream, Garfield imagines that he's Lance Sterling, a droll soldier of fortune accompanied by his faithful associate Slobber Joe (Odie) on a Middle East mission. Their assignment: recover the stolen Banana of Bombay, the source of the old banana peel sight gag and therefore "the symbol of humor to nations around the world." Story by "Garfield" creator Jim Davis. Voices...Garfield: Lorenzo Music; Jon: Thom Huge; Fat Guy/Rameet: Frank Welker; Nadia: Julie Payne; Odie/Waiter: Gregg Berger. Music by David Benoit and Desiree Goyette. In this animated show, Jim Davis' feisty feline is on his own after slipping out of the car on a trip to the vet. Forced to scrounge for food, Garfield has a run-in with the mean Ali Cat and his gang, and is later reunited with his long lost mother. Music performed by Lou Rawls and Desiree Goyette. This animated show features a camping adventure in the forest primeval with the rotund and acerbic Garfield the cat. Packing for a vacation, Garfield is appalled to discover his destination: he's getting back to nature with his owner Jon and his playmate, Odie the mutt. Of course, Garfield isn't in for much fun - the forest rangers insult him; the tent doesn't fit him; Odie dunks him in the lake; and, to top it all, a vicious panther is on the loose - and may be stalking him. "Garfield in Paradise" finds the cool cat, his owner Jon, and Odie the dog vacationing on a tropical island along with the High Rama Lama of rock and roll (voice of Wolfman Jack), a princess and her cat - and a rumbling volcano. Garfield, Odie and Jon have stars in their eyes: they're auditioning for the TV talent show "Pet Search" as '50's rockers Johnny bop and the Two Steps and, if they win, they'll get $1000 and a shot at the national finals in Hollywood. Created and written by Jim Davis. Music by Ed Bogas and Desiree Goyette, performed by Lou Rawls, Lorenzo Music. The Ocean Blue: Garfield and Odie go sailing on Jon's new boat and a hungry shark shows up. Horror Hostess Pt. #1: Jon gets to meet Vivacia, the TV horror show hostess of his dreams. The man Who Hated Cats: Jon's new next door neighbor, Mr. Block is a cat hater and Garfield has to find out why. Alley Katta & The 40 thieves: Garfield and Jon try to help out a sultan, who is constantly being robbed, in the ancient Middle East. The Jelly Roger: The ancestor of one of the most hungry pirates sets sail with Jon's new boat as one of his targets. Thoroughly Mixed Up Mouse: Irwin the Mouse wants to be cast and Garfield lets him be one. The Suburban Jungle: Jon's "˜Valley Girl' niece, Shannon has to be retrieved by Garfield and Odie so they can get Jon to find them. Sit On It: Garfield sits on Jon's school book and refuses to get up. The Stand Up Mouse: Floyd's sub-leaser, Myron the Mouse, puts on a show with him doing a stand-up act derogatory to cats to try and goad Garfield into chasing him. Guy Of Her Dreams: Penelope is back singing why she loves Garfield. Model Behavior: Supermodel Heather keeps leading Jon on, while only wanting Garfield for herself. Puss In High Tops: In this fairy tale, Garfield wins the hand of a Princess for Jon. My Fair Feline: Garfield gets thrown into the Lamaar School of Cats and turns the rest of the cats into "˜Garfields' rather than Garfield becoming a refined cat. Matter Of Conscience: Ichabod Cricket shows up to be Garfield's conscience, and everything backfires. Jonny Ragweedseed: In frontier America, Jonny Ragweedseed (Jon) with his cat Roosevelt (Garfield) walks from shore to shore to make sure that ragweed will cover the land and he is chased from sneezing town to sneezing town for his trouble. The Ocean Blue: Garfield and Odie go sailing on Jon's new boat and a hungry shark shows up. The Monster Who Couldn't Scare Anybody: Michael is a child monster than can't scare anyone until he enters the farmyard. Arbuckle The Invincible: Jon becomes invincible with the help from some outer space aliens. Horror Hostess Pt. #1: Jon gets to meet Vivacia, the TV horror show hostess of his dreams. Newsworthy Wade: Wade Duck is caught in a 60 minute style interview. Horror Hostess Pt. #2: Vivacia shrinks Jon to the size of a rat to complete her miniature baseball team. The man Who Hated Cats: Jon's new next door neighbor, Mr. Block is a cat hater and Garfield has to find out why. Déjà vu: All of the farmyard is caught in a repeating cycle of each character's most comic zany bit. Canned Laughter: Jon builds a stand-up comic robot. Alley Katta & The 40 thieves: Garfield and Jon try to help out a sultan, who is constantly being robbed, in the ancient Middle East. If It's Tuesday This Must Be Alpha Centauri: Orson's imagination takes Wade and Roy on an 'out of this world' experience. Clash Of the Titans: Garfield and Odie find themselves caught in a superhero cartoon. The Jelly Roger: The ancestor of one of the most hungry pirates sets sail with Jon's new boat as one of his targets. Farmyard Feline Philosopher: Philo is back to help give motivational speeches to the weasel and Wade. Dogmother 2: Esmeralda is back and grants everyone in the house as many wishes as they want. Thoroughly Mixed Up Mouse: Irwin the Mouse wants to be cast and Garfield lets him be one. Old Man Of The Mountain: Wade visits the Sage on top of the mountain to see how to overcome his fears. The Food Fighter: Jon becomes the chef to the Heavyweight Champ of the World. The Suburban Jungle: Jon's 'Valley Girl' niece, Shannon has to be retrieved by Garfield and Odie so they can get Jon to find them. Thing In The box: A package for Bo sheep is delivered to the farmyard and everyone takes guesses on what or who is inside. The Feline Philosopher: Garfield gets confidence from a motivational speaker. Sit On It: Garfield sits on Jon's school book and refuses to get up. Kiddy Korner: Aloysius Pig is back as a representative of 'The Network' to make the farmyard a less violent place and he finds that even nursery rhymes have violence. Brainwave Broadcast: Garfield thwarts a bank robbery while showing us at home why he can hear his thoughts. The Stand Up Mouse: Floyd's sub-leaser, Myron the Mouse, puts on a show with him doing a stand-up act derogatory to cats to try and goad Garfield into chasing him. Daydream Doctor: Edward R. Furrow is back psychoanalyzing the weasel and Orson, getting them to try and understand their two passions: chickens and daydreaming. Happy Garfield Day: Garfield eventually drives Jon out of the country by constantly reminding him, with every means at his disposal, his birthday is coming up. Song: "Lasagna Prima Verda"
Guy Of Her Dreams: Penelope is back singing why she loves Garfield. Song: "the Guy of My Dreams." Discount Of Monty Cristo: Aloysius Pig is back trying to cut the budget of the show. Fairy Dogmother: Esmeralda is sent from doggy wish Central to fulfill Odie's wish to go to the Doggie Ball. Puss In High Tops: In this fairy tale, Garfield wins the hand of a Princess for Jon. Egg Over Easy 1: Wade decides to shell himself up because of all that is scary about the world. Beast From Beyond: Sidney the dinosaur comes out of a cave and decided the best way to take over the world is to paint himself pink and start a children's show but, Garfield won't have that. My Fair Feline: Garfield gets thrown into the Lamaar School of Cats and turns the rest of the cats into 'Garfields' rather than Garfield becoming a refined cat. Double Trouble Talk: Roy rooster learns the art of double speak to get out of doing his chores, but eventually everyone learns and no work is done in the farmyard. Half Baked Alaska: Garfield finds Ichabod, the conscience cricket, that lets Jon express his true feeling to his boss, who wants him to move to Alaska. Matter Of Conscience: Ichabod Cricket shows up to be Garfield's conscience, and everything backfires. Grape Expectations 2: Roy is found innocent of leaving the grape harvest unattended. Top Ten: Garfield runs down his top ten lists for the show. Garfield and Friends is currently available to watch and stream on CBS. You can also buy, rent Garfield and Friends on demand at Vudu, Starz, DIRECTV NOW online.